In this tutorial, we will show you how to create your own plugin, so you can add a new block using the API method. The plugin we create in this example will create a shortcode that you can add to your posts or pages. We will show you how to create your plugin using the code examples below. Let’s begin! First, create a folder and name it for example “td-creative-plugin”. Some developers choose a name that describes what the plugin actually does. 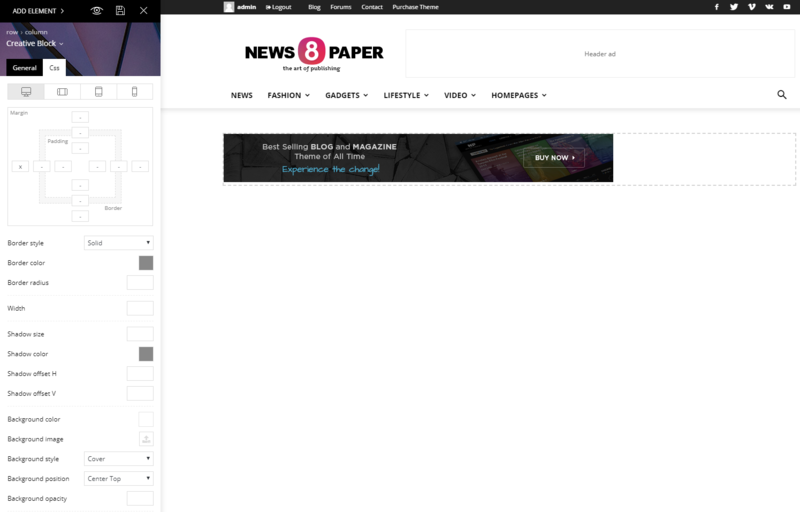 Using our Newspaper theme you will be able to create a custom element using just 2 PHP files. The first file is the one where we map the shortcode and the other file is the shortcode itself. For more complex plugins you can integrate a stylesheet and js code but in this case, we will integrate the tagDiv Design Options, so we do not need a stylesheet file at the moment. The code is fairly simple! There is a comment, so WordPress will use the data to output the plugin’s name and specific data in the Plugins section of the back-end. We set the plugin’s path for the other files which may be added and we will use the hook function to register our element. There are two variables which are used to define the path: $plugin_url and $plugin_path. For public content like images or css you have to use $this->plugin_url , for the php files you have to use $this->plugin_path. Now let’s register a new block! For example, I need an extra block to add an image or banner and a link, similar to the functionality of a custom ad block. 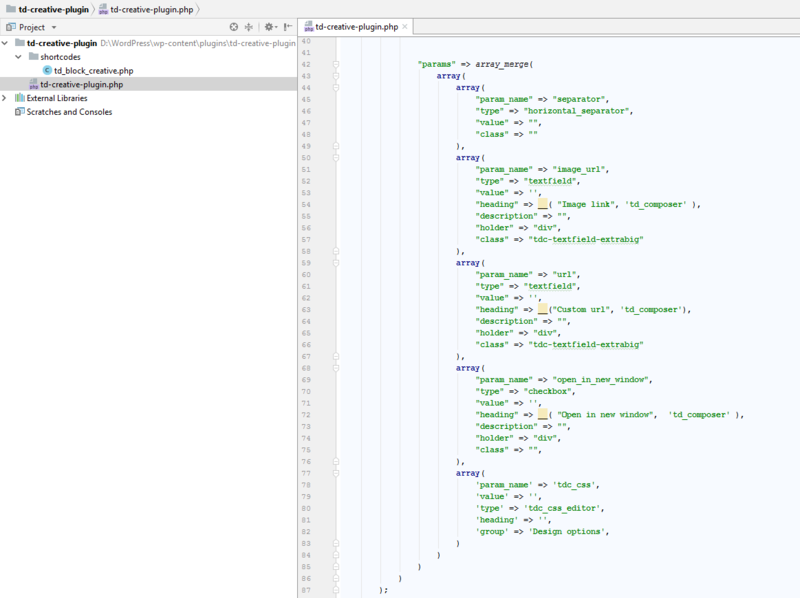 In the next section we will map the shortcode to the tagDiv composer Page Builder. We also give it a name (Creative Block) and implement it into the group of elements we want to create. 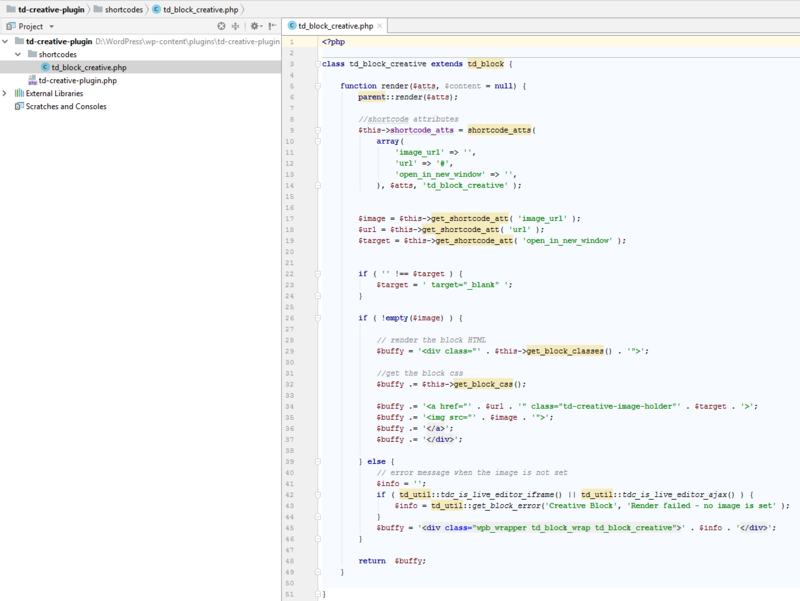 I’ve specified above the plugin’s path, now is time to use it and target the shortcode’s path. I’ve created a /shortcodes folder where you can add more elements for a more complex project. My element needs different types of parameters. I need the image url, a custom url and an option to open the image in a new window. In this case I’ve also added the Design Options.